Aeolian Playgrounds is a sound sculpture concept by Damien Ricketson. 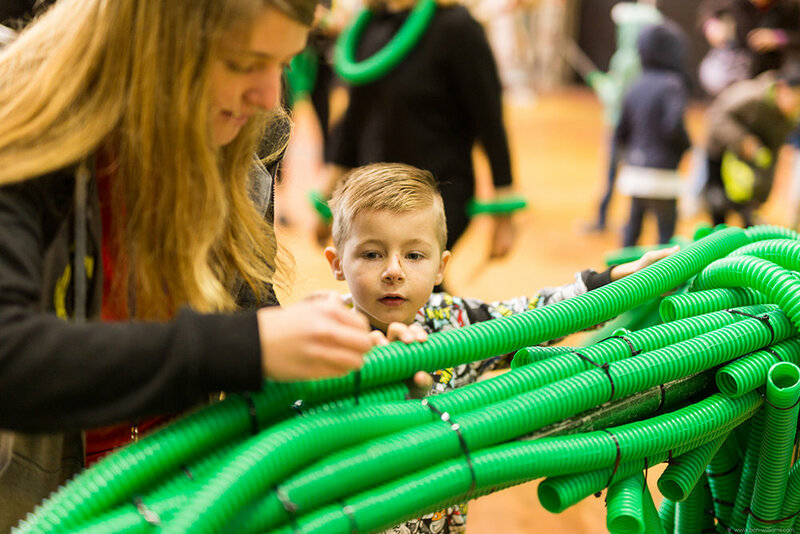 Comprised of brightly coloured flexible plastic pipes, these temporary structures are simultaneously visual sculptures as well as giant musical instruments. The public is invited to explore and ‘perform’ these structures with leaf blowers as though they were fantastical pipe-organs. Each new edition of an Aeolian Playground is given a unique title and designed as a site-specific work responding to the context in which it is presented. The concept is highly adaptable to a variety of visual forms and sizes in both outdoor and indoor settings. The concept has proven particularly popular with children. Over 10,000 interacted with the most recent edition, Pipe Dreams Green. 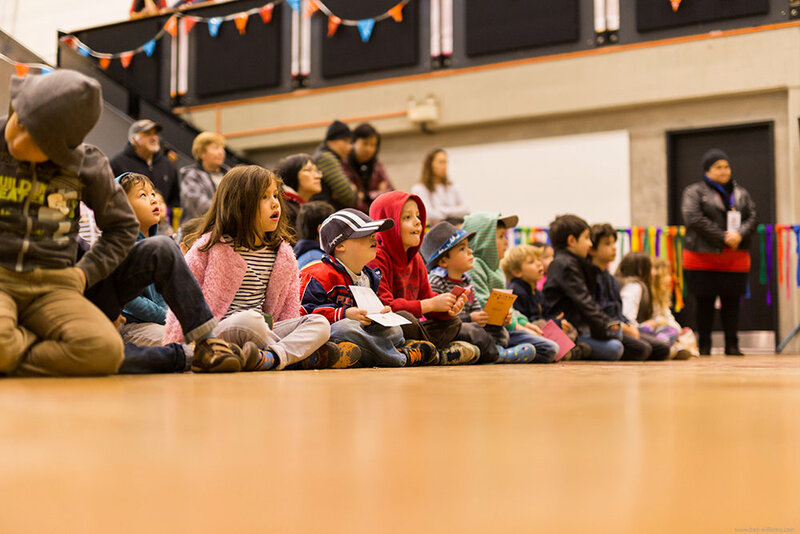 The striking visual display may be enhanced in a variety of ways including: performances by musicians integrating the haunting sound of the pipes with conventional instruments; public interaction and facilitated play with whirlies and leaf blowers; audience participation in growing the structures and; associated workshops to learn about the nature of sound and wind instruments. 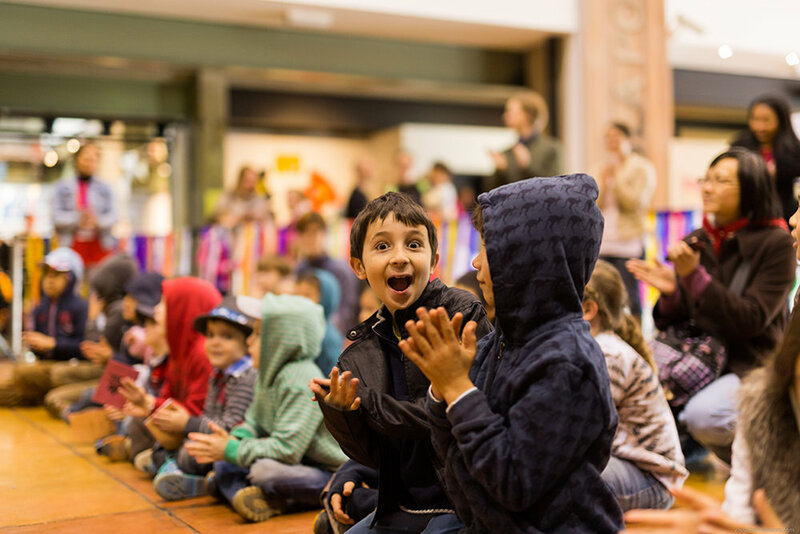 Aeolian Playgrounds brings together bold colourful forms and haunting melodies that promote the playful exploration of sound in a fun hands-on public installation. See below for existing editions of the project. Calliope’s Nest by Ensemble Offspring | Micro Parks 2014 from Performance Space on Vimeo. A small oasis of nature in a human-dominated environment, an inner city park provides an urban nest for city birdlife. In this small pocket of green sits a giant blue plastic nest that may be performed as a musical sculpture. Sounded by the wind alone, this garish structure becomes an aeolian harp murmuring gently to the birds. The alien object is subject to inexplicable performance ceremonies: bizarre modern-day rituals that both exalt and interfere with nature. 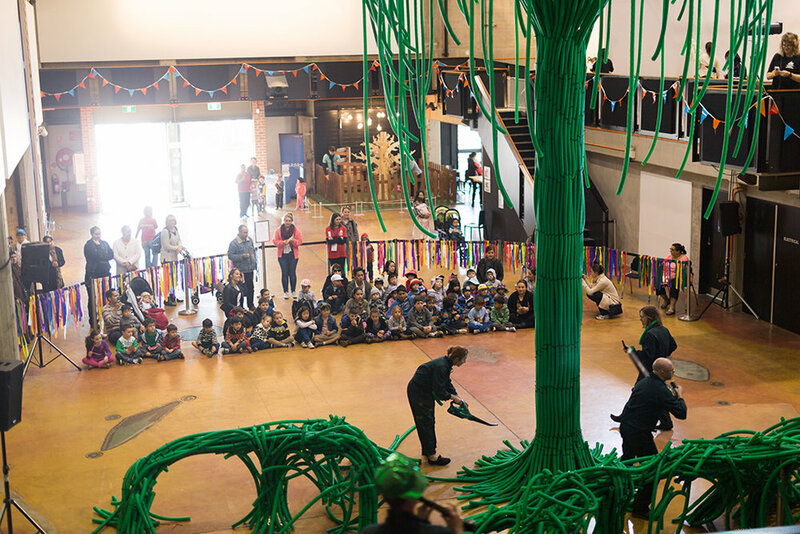 In the centre of Casula Powerhouse’s vast Turbine Hall stands a giant tree-like structure made from brightly coloured plastic tubes: a clash of organic forms and artificial materials. Over the course of the festival, the tree grew. Not upwards, but outwards. Root-like tendrils attached by children snaked around the space matting around one another to form magical wave-like forms. At periodic intervals absurd workers wielding leaf-blowers breathed life into the tree that sings melodies to this mechanical wind.